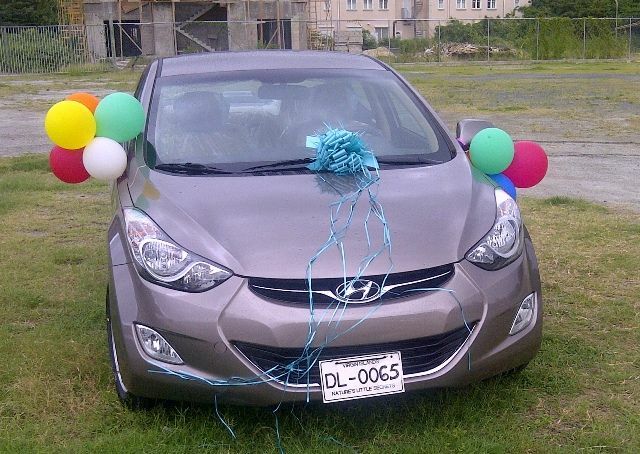 ROAD TOWN, Tortola, VI- All is well that ends well is certainly the case it seems as Miss BVI 2012/2013 Sharie B. de Castro received her shining new Hyundai Elantra from the Virgin Islands Festival and Fairs Committee for winning the Miss BVI Pageant in August. The long-awaited presentation was made today December 21, 2012 at the Festival Grounds in Road Town. "I love it, I am satisfied and I am happy. its amazing car," Ms de Castro told Virgin Islands News Online while she sat comfortably in the driver's seat of her prize. Miss de Castro also related that the handing over of her prize was timely in more than one way since apart from it being the Christmas season she will also be celebrating her birthday on December 31. "I just want to say thank you to the VI Festival and Fairs Committee for handing over this prize, the car. I really appreciate it..it has come in the season, christmas time and my birthday is just around this time as well." 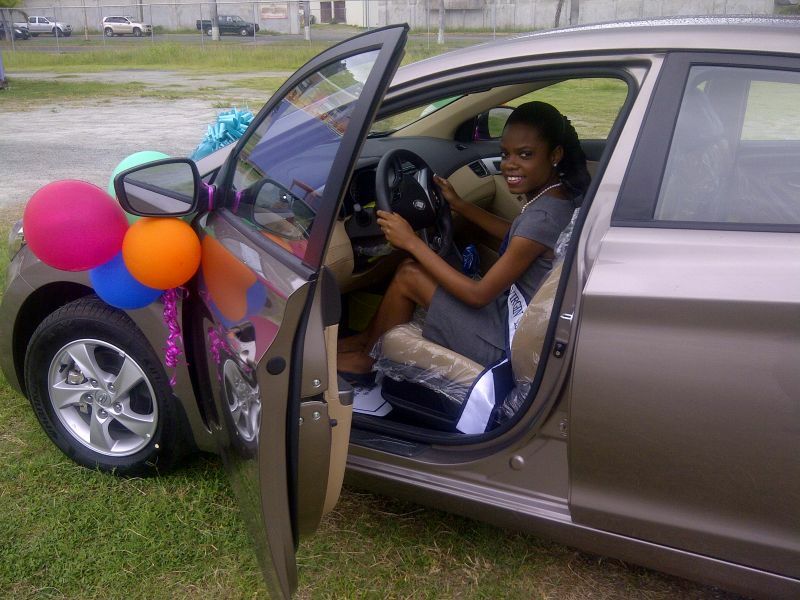 Only last month controversy surrounded the issue of the prize when the pro-government news site, BVI Platinum News, posted an article reportedly about the reigning Miss BVI allegedly being “unhappy with car”, a prize that was offered to her for winning the Miss BVI crown on August 5, 2012. Virgin Islands News Online was made to understand that persons within the Miss BVI circle were outraged at the article, which they said seemed to be an attempt to portrait the queen in a negative light. Among de Castro's prizes for winning the pageant was a car, which she had allegedly requested be changed as it did not have the capacity to climb steep hills and also parts for the maintenance of the vehicle would have been difficult to source in the VI. The queen had also reportedly requested to pay the difference if exchanging the vehicle would have been at an additional cost to the VIF&F Committee. The Committee had agreed to reach Ms de Castro’s request, however, a source close to the de Castro family said the writer of the article did not even seek to contact the queen before publishing the article, which seems to suggest that the queen is ‘ungrateful’. Although not getting into specifics, Miss BVI 2012/2013 Sharie de Castro issued a written statement on November 29, 2012 in which she stated that a recent publication had inaccurately characterized her position on prizes awarded to her by the Virgin Islands Festival and Fairs Committee (VIF&F). She also made it clear that her “position on prizes awarded to me” was not an expression of a lack of gratitude. 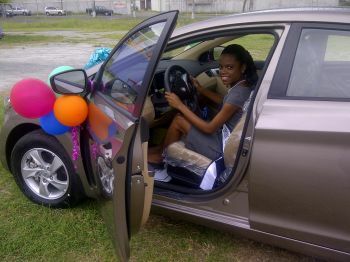 The keys to the car was handed over to Ms de Castro today by Chairperson of the Miss BVI Pageant Committee, Alicia Hamm. Let Platinum tek that in dem behind…go Sherrie we are all proud of you!!! Why that cheap car she deserves a KIA Sportage instead. What r they going give our Miss Universe NOW!!!! Great news!!! As the propaganda machine Platinum tried to ruined this thing for the young lady...what a beautiful car for a sweet and elegant person. The Elantra is nice but if they couldn't get her something a little better the could've given her the Elantra in its to trim, not the base model, the elantra's top trim is only not no more than $25,000. But I guess she is satified. @Sort - Fool what is ruined. You people are sickening. Let the girl be and find something constructive to blog about. TO SORT: Hush your nasty wicked hateful backside. Too many of ayo still jealous that we have for the first in a long time an indigenous Virgin Islander to represent we..... A full blood! we really don't give a damn what "sort" have to say. SORT Rather a cruel comment, surely. she is satisfied because she got a free upgrade from what was intended. she dictated the quality of her prize.